LED Masks. What Are Skin Benefits of LED Light Therapy? Celebrities have fallen for LED light facial masks. Anti-acne LED therapies are increasing in popularity. Fancy knowing the properties of LED light and its skin benefits? Read on. Hands down, there are lots of ways to fight acne and other kinds of skin conditions. Many people use the assistance of specialists and undergo skin procedures. Others want to keep the beauty of skin using home remedies and methods. Today, we can combine both methods and try LED light home therapy. All you need is the choice of a high-quality LED facial mask. Skin problems require innovative solutions very often. Our skin needs proper stimuli to regenerate and reinforce such as mild LED light, working on the deepest skin portions. LED lamps have been used in dermatology for a long time but only recently we have started wondering about the properties of LED light. We are unravelling its growing possibilities in the treatment of acne, photo-ageing, removing pigmentation spots and stretch marks, cleaning pores, speeding up wound healing, curing inflammation and even alleviating the symptoms of depression. Check other ways in which LED lights work. What are the properties of LED light? It enhances the treatment of different forms of acne. It stimulates cellular renewal, rejuvenates and repairs. It lessens stretch marks, wrinkles and pigmentation spots. It soothes the symptoms of psoriasis and cold sore. It boosts skin moisture and nourishment. It stimulates faster hair growth and prevents hair loss. It eliminates skin grayness and sallowness. It removes dark under eye circles and puffiness. It reduces the disturbed pigmentation in skin. How does the light therapy work on skin? We must start with the fact that LED light is a monochromatic light which has different colours (different wave lengths). If we direct it on the skin, it reaches every cell, transferring energy there, not heating or causing irritations. Depending on the length of the wave emitted by the LED lamp, the effects are different. What happens with the energy that the cells absorb from the light. It is used for the repair processes, resulting in fast-renewing cells, boosted blood flow, nourishment and moisture, an increased collagen synthesis, stronger, smoother and radiant skin. The natural body resistance to internal and external harmful factors is enhanced. LED light action gives numerous benefits. However, these benefits depend on the colour of the LED light we choose. The skin can be exposed to many colours, each one working in a slightly different way. How? Red LED light – works most deeply, stimulates the production of collagen and enhances the cellular renewal, therefore it is used for anti-ageing procedures. 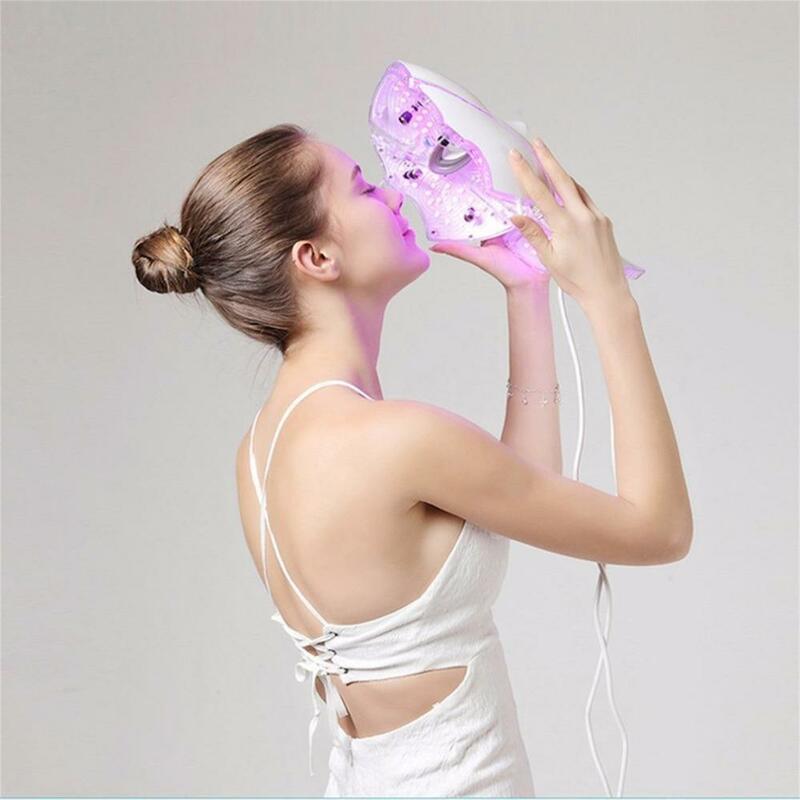 Blue LED light – penetrates the skin as deeply, fights bacteria, soothes irritations and redness so it’s suitable for the anti-acne treatment. Yellow LED light – improves the work of nervous and lymphatic system, therefore it can be used for relaxation therapies. Green LED light – speeds up the repair of the epidermis, illuminates and adds elasticity and that’s why it’s common in anti-wrinkle therapies. The fact that you can successfully do a LED light therapy at home is probably its biggest benefit. It is safe so it doesn’t require the knowledge and experience of an aesthetician. It won’t cause burnt skin even if we affect the skin with the light longer than recommended in the leaflet. Nevertheless, many women have LED light therapy done at beauty clinics because the purchase of a device is pricey. Recently, a reasonable solution appeared – LED light facial masks. When it comes to the design, it resembles a theatre mask since it’s usually available in white. It comes with a cable; the interior is equipped with hundreds of LED diodes which can emit light of different wave lengths. Even though it looks quite creepy after putting it on and starting it, the results are spectacular. Several-week, regularly-performed LED light therapy is enough to spot an upgrade in the state of skin. Before applying the mask, we precisely clean the facial skin. We sit comfortably and put the mask on face. We switch on the mask and wait until it turns off after 10 minutes. Next » 8 ways for pampering oily skin « Previous Wrinkle Fillers. Which acid to choose?